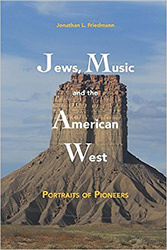 Dr. Friedmann’s latest book, Jews, Music and the American West: Profiles of Pioneers (Gaon Books), has just been published. It’s available on Amazon for the life-affirming price of $18. It should be of interest to lovers of Jewish music and/or local history. The book highlights musicians who helped shape the unique cultural landscape of the Western United States. Most of the men and women profiled made their marks in the late nineteenth to mid-twentieth centuries, with a few remaining active beyond that time frame. As a group, they typify the freedom of opportunity and creative expression characteristic of the region. As individuals, they represent multiple areas of the musical experience: commercial, sacred, performing, conducting, composition, criticism, education, enrichment, vocal, and instrumental. Profiles include: Anna Hertzberg, who founded the Tuesday Musical Club of San Antonio; Rabbi Mendel Silber, who studied the Jews’ involvement in European concert music; Allie Wrubel, who wrote popular songs for major Hollywood films (including “Zip-a-dee-doo-dah”); composer Frederick Jacobi, a San Francisco native; Cantor Reuben Rinder of Emanu-El, San Francisco; Cantor Leib Glantz of Sinai Temple; Cantor Samuel Fordis of Valley Beth Shalom, etc. ; Bay Area theater director Jerome H. Bayer; Chuck Feldman, music director of Wilshire Boulevard Temple; and Rabbi Wolli Kaelter of Temple Israel, Long Beach. There are also two non-Jews who contributed to Jewish musical life: Margaret Blake Alverson, who sang in Bay Area choirs during the late nineteenth century, and Pearle Irene Odell, a Progressive Era educator who started the Neighborhood Music Settlement in Boyle Heights.